Keith Curle says he is still just concentrating on putting the Cobblers’ ‘own house in order’ as they close in on the teams above them in the Sky Bet League Two table. A five-match unbeaten run and two away wins on the spin have raised spirits among the club’s support, with those possessing a positive outlook even dreaming of a late-season tilt at the play-offs with 11 games of the season to play. Saturday’s home date with fifth-placed Exeter City (kp 2pm) is quickly followed by another game at the PTS Academy Stadium, against Newport County next Tuesday night, and although Curle isn’t about to start talking up any sort of play-off bid, he isn’t ruling it out either. Town are still down in 16th in league two, but there is still almost a quarter of the league two season to play, with 33 points on offer, so there is a lot to play for. 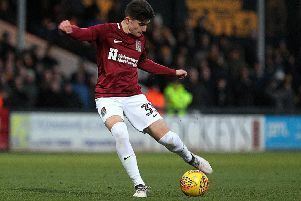 “I know where we are, the changing room knows where we are, and the important thing is the focus is still on our results,” said the Cobblers boss. “First and foremost you have to put your own house in order before you get into the latter stages where other teams’ results become important. The main focus this weekend will be transforming the team’s impressive away form into a good home showing. Unbeaten in five, with three away wins in that run, Town haven’t tasted victory at the PTS since they beat Carlisle United 3-0 on January 12. That is their only home win in their past eight league games, a runs stretching back to early November, with Curle’s men registereing six draws and one defeat in that time. Having only played at home once since February 2, and with that being a dour 0-0 draw with Crawley Town, Curle is keen to give the PTS faithful something to cheer, but he knows it is going to be a difficult test against play-off hopefuls Exeter on Saturday. “What every manager, coach and player wants is to perform at home,” said the Cobblers boss. “Everybody would like the opportunity to perform and win in front of your own supporters, but this Saturday is going to be a difficult challenge. “Exeter are interested in their own result, but also in the results of people around them because of where they are in the league, and sometimes that can have a negative effect. “Our focus and concentration is on our results, and what other people do is down to them. The Cobblers have a virtually fully fit squad to pick from, with the only absentee through injury being Brighton loanee George Cox.